The Ricketts family meets the media today at 11:00 AM. I'm certain it will be riveting television filled with non-specifics. Remember, these are new people admitted to a club. They aren't going to start by making any waves. You may hear some semi-detailed things about the plans for the physical plant that is Wrigley Field. They may talk about timing for upgrades and renovation because they are certainly aware that every day they delay risks some fan getting pulverized by a few tons of falling concrete. The worry warts who were anti-sale because of unsubstantiated fears that the new owner would tear down Wrigley have nothing to worry about. The rumor of ticket price increases is proof if this. As noted on other blogs, the park was empty the last two weeks of the year. Fans, smartly, kept away from a bad product. Despite the bad baseball product, management clearly believes the demand for Wrigley Field tickets hasn't subsided. This is due to the fact that the Wrigley Experience minimizes subscription risk. No owner is going to destroy Wrigley as doing so removes the safety net in bad baseball times (as 2010 projects to be). The correct answers to these questions, from a fans' perspective are: yes, yes, hopefully none as the debt hopefully is at fixed interest rates, and yes to personal support. Maybe they'll surprise us with some quick decisions that they've had as much as four years to plan out. One expects that the real decisions will start trickling out over the next 5 months. All that said, hope is alive. Crain's with the first report from the scene. The Ricketts Family is, as of this minute, the owner of the Chicago Cubs and Wrigley Field. According to Crain's, the deal closed this morning. The banks funded the deal, the cash changed hands, and the Tribune is out as a decision maker. This day is a huge day for hope, and celebration that the Tribune is gone. It is not a day to beatify the Ricketts. They have done nothing yet to deserve it. For those that say the Ricketts are going to be great owners, there were many Washington Redskins fans who said the same thing about Dan Snyder. That hasn't worked out very well. The Ricketts family may very well end up being terrific. Time will tell. And the trust of the fans must be earned, not gifted as many seem ready to do. That said, today is a cause for hope because, under Tribune ownership, there was no chance of success. That impediment is now gone. Oh, and someone get word to the proprietor of Bleed Cubbie Blue: You owe up on your steak bet. You lost. The first Bond Bad Guy was nearly the best. What's White Fang gonna do now? One report has it as three years and $2.42 million but the Cubs could not confirm that figure. The 59-year-old Jaramillo comes to the Cubs from the Texas Rangers, where he spent 15 years and earned a reputation as one of the top hitting coaches in the game. He became available after the Rangers offered him only a one-year contract extension, which he declined. A few points about this hire. First, being the hitting coach for a team where Jose Canseco said he introduced Rafael Palmeiro, Ivan Rodriguez and Juan Gonzalez to steroids suggests that other things were at play in the good hitting other than Jaramillo's five point approach. Since 1995, the Rangers scored 5.70 runs per game at home, the best home mark in the American League and second only to the Colorado Rockies. On the road, that drops to 4.90 runs per game, 10th in the majors and ninth in the American League. In other words, there’s a big ballpark component to his success as measured by the success of the Rangers offense. Believing that Jamarillo will actually make a difference is a belief that takes a lot of faith. Third, some quarters seem to to think that a three year, $2.42 million dollar deal is a sign that the salary spigots will be open under the Ricketts regime. Spending $30,000 LESS over THREE years compared to what the Cubs are spending in ONE year for Aaron Miles is proof the payroll will go up? Coaching payroll is a rounding error to a major market team. This signing is no different. The Cubs payroll next year for their 25 man roster will be close to $135,000,000. Jamarillo's $800,000 salary equates to 0.059% of that payroll. Look at it this way: If the Cubs 25 man payroll was $50,000, the Jamarillo's salary would be $296.29. This signing says nothing about future payroll commitments. Lastly, the length of the signing is interesting. With Lou Piniella retiring/quitting after the 2010 season, the next Cub manager will not have the ability to hire their own hitting coach. That's an interesting restriction on the next manager. 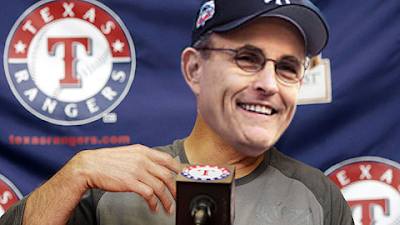 And, given what we know about the last 15 seasons with Jim Hendry in the organization, Rudy could be here for the next GM as well. Kenji had an option to return to Japan and used it - leaving all $16 million on the table by walking away. GM Jack Zduriencik tactfully said the decision was all Johjima's. "We are very appreciative of everything Kenji has done for this organization over the past four seasons," Zduriencik said. "We respect his decision to return home. Joh has been a terrific teammate and a great competitor. His work ethic, production and desire to win made him a positive role model. We wish Kenji the very best and will follow his career." Signed before the 2006 season – at the behest of Japanese ownership – Johjima batted .291 with 18 home runs and 76 RBI over 144 games of his first season. Those were numbers he’d never repeat. One wonders if Kosuke Fukudome has a similar clause in his contract and if he'd consider exercising it. Then again, this is a Jim Hendry contract. To expect a pro-management clause like this without some sort of financial kicker is probably unreasonable. Ivy Chat has no ill-will against Mr. Fukudome, but readily agrees that his contract money would be better spent on other players. Does anyone know if Chunichi needs an outfielder back? If anyone pays this family a cent for their "story," they are contributing to child abuse. The team filed for bankruptcy in Delaware on Monday. The move was anticipated as the Tribune Co. looks to complete an $845 million sale of the team, Wrigley Field and related properties to the family of billionaire Joe Ricketts. The purpose of this is to legally release the Cubs from financial obligations that are tied to their corporate parent, the Tribune Corporation. Things that will be released are financial guarantees and any other contracts that need to be dissolved. If the judge is a Cub fan, perhaps he could negate three other contracts? I'm thinking of the ones with the names "SORIANO," "BRADLEY," and "HENDRY" on them. With the focus on 2010 and the sale of the team likely three weeks away from closing, there’s a lot of discussion on what’s going to happen to Rich Harden and will the Cubs offer him arbitration. The Cub Reporter goes so far as to suggest that this decision could affect Jim Hendry’s hold on the Cubs general manager job (see: Arbitration is Going to be the End of Jim Hendry). First off, Jim Hendry’s job security is far more closely tied to the contracts of Alfonso Soriano and Milton Bradley, and the performance (or lack there of) of the minor leagues that Jim Hendry has run since 1995 compared to whether or not he gets a draft pick back in compensation for Rich Harden. But back on point: There’s almost no way that the Cubs can offer arbitration to Harden. He is not a risk the Cubs can afford in 2010. The Cubs have three of their five rotation spots filled in with Ted Lilly, Carlos Zambrano and Ryan Dempster. Slot number 4 is reserved for Randy Wells until he proves he doesn’t deserve it. That leaves one spot for Harden. But the Cubs also have Tom Gorzelanny, Sean Marshall, and Jeff Samardzija as candidates for the job. These names don’t even include long shots like Casey Coleman into the mix. All these guys are a lot cheaper than what Harden will cost. Then, you add in that Harden was only good for 141 innings this year. That low total comprised the third best total in his career. He’s only been over 148 innings once and that was the five seasons ago. Harden on your team requires you to essentially have an extra arm in the bullpen and a 6th starter ready at all times. And, as others have noted, the reasons for shutting Harden down for the last three weeks weren’t exactly shouted from the rooftops and Harden himself didn’t complain about it. How healthy is he? Is he worth the financial commitment if he’s not healthy? Now, you risk that he’ll get $10 million or more in arbitration. That’s on a team that will have a payroll of close to $135 million for 20 players. On a franchise that will be levered to the hilt. If this was 2011 and the Cubs were starting to see payroll runoff, they could spend $10 million on a pitcher who would pitch 75% of the time. In 2010, with payroll commitments peaking, money to be paid to Milton Bradley for not being here and improvements to the lineup needed, it’s nearly impossible to see how Rich Harden gets an offer of arbitration. If the handling of the Harden situation is a "bad" on Hendry, it’s going to be for not letting Harden go via waivers and saving over $1 million in payroll in 2009. Non-tendering him would be a decent baseball move and a required one for the 2010 Cubs financially. David Kaplan reports that MLB owners have unanimously approved the sale of the Cubs to the Ricketts family by a vote of 29-0 via conference call. The last two steps are the pre-packaged bankruptcy of the Cubs to clear away all contingent obligations of the Cubs to the Tribune and Shawon Dunston, followed by funding of the bank debt 10 days later. The Trib could be out by Friday, October 23rd. Let's hope Crane Kenney and Jim Hendry are out by Halloween. Yeah, it's unlikely, but that would be a hell of a treat compared to the tricks they've played on us. Sometime in the next few hours, the International Olympic Committee will vote on where the 2016 Olympic Games will be held. This page certainly hopes that the games are awarded to Chicago. In general, public financing of sporting events is a bad thing, especially when those funds are used for single purpose stadia that benefit the financial well being of the single already high net worth owner of the benefiting team. But the Olympics are not that type of event. Yes, many people stand to make a lot of money off the games. That's part of the key: The money will be spread out among hundreds of businesses and thousands of jobs will be created and last for many, many years. Furthermore, where Chicago really stands to benefit is in the redevelopment of blighted and ignored areas of the city. Look at the Lake Michigan shore line from Soldier Field south to the Museum of Science and Industry and compare it to the same area to the north. On the north side there’s some of the best real estate in the country: Lincoln Park. On the south side, you see miles of underdeveloped and underused lake shore and the blight that was Michael Reese Hospital. There are two points that are generally used to oppose the Olympics. Both are valid, but one is severely mitigated. Point one is the cost. Where is the $10 billion in construction funds going to come from? Is this all going on the taxpayers? The answer to this is that a large portion of the funds come from the money the games themselves generate. NBC is paying nearly $1.2 billion to broadcast the London Olympics. That number will likely go up for Games that are timed to maximize American TV viewing habits as a Chicago games would. NBC isn't the only broadcaster. In general, international broadcast rights fees are about 65% of the American rights fees. This means $2 billion from TV revenue alone is available to pay for the cost of the games. The other sources of revenue? Ticket sales, memorabilia sales, corporate sponsorships (how much does Visa pay in? ), and yes, taxes. But, if you can get, say, $10 billion in development and have 70% to 80% of the cost paid for, isn't that worth it? This city has blown nearly a billion dollars on Soldier Field and Comiskey Park, alone. And who benefits from that? Jerry Reinsdorph and the McCaskey Family. If the South Shore could become a second Lincoln Park, everyone would benefit. The benefit is worth the risks of costs in this view. The more reasonable argument against is that of trusting Mayor Richard Daley to do it right. This is a very valid argument. Just look at the aforementioned Comiskey and Soldier Field deals. How much better would the bid look if Soldier Field had been truly redone as an 80,000 seat retractable roof stadium? You worry with Daley about the vision thing. You also worry about the graft thing. Yes, there's a good chance not all of the money spent will be spent above board. OK, more than a good chance. A lot of it will. There's no answer to this other than to say, "Yeah, but the Games are going somewhere. And graft will go where the games go. Might as well be our graft." Ivy Chat supports the Bid. As to if Chicago will actually get it, the betting line here is that the Games were a lock the minute Sen. Obama became President-Elect Obama last November.